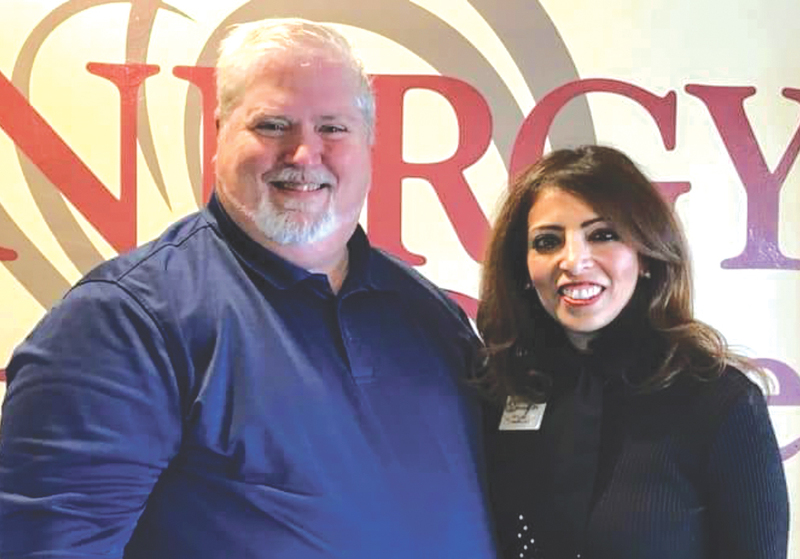 Weama Kassem, CEO and President of SYNERGY HomeCare with Jeff Aynes who recently joined the SYNERGY Home Care Team as their Director of Sales and Marketing. SYNERGY HomeCare proudly opened their doors over 5 years ago in Edmond, Oklahoma. Weama Kassem, CEO and President of SYNERGY HomeCare, has always dreamt of having a business that centered around caring for others; specifically, our aging community. Weama has been fortunate enough to attract a team of professionals with the same heartfelt drive and talent. The people Weama has assembled have accomplished some incredible things by always putting their clients’ needs and happiness first. The SYNERGY HomeCare team always refers to each other as “SYNERGY Family” and they work together to create an atmosphere of care and respect for each other and for their clients and families. Weama opened her second office in December 2016 in Norman, Oklahoma. This enabled the company to reach and connect a larger clientele and reaching beyond Edmond and Oklahoma City. One of the most essential guidelines in opening the new location has been to duplicate their high standard of care. SYNERGY HomeCare does not use contracted caregivers, all are employees who must completed in-house training, along with continued monthly and quarterly training programs. This ensures the caregivers are not only qualified, but it strengthens the support and bonds within the company itself. Each caregiver is a Certified Nursing Assistant and/or a Certified Home Health Aide. They are each insured and bonded by SYNERGY HomeCare and strive to provide excellent care and support to both clients and their families. SYNERGY HomeCare is very pleased to announce that Jeff Aynes has joined the SYNERGY Home Care Team as our Director of Sales and Marketing. Jeff has been a strong advocate for health care in Oklahoma for many years and will make a great leader on our team. Jeff is a father of two beautiful ladies and grandfather of two beautiful girls. He went to the University of Central Oklahoma and Oklahoma State University where he studied Marketing, Public Relations, and Broadcasting. Jeff is a Past President of Marketing Plus for Healthcare and currently serves as Secretary. He is currently serving as President of the Northside Marketing Alliance, as well as, Secretary. He has served in the community for many years as a member of the Shriner’s, Scottish Rite, Eastern Star, Amaranth, and Masons where he is a Past Master. He has been volunteering with Muscular Dystrophy, Cerebral Palsy Association, and Make Promises Happen Camp for over 25 years. His passion outside of Sales and Marketing is music. He has owned Jammin’ Jeff Entertainment for over 25 years and has performed over 1,800 events. Jeff joins the SYNERGY staff from AllianceHealth Midwest where he served as Director of Marketing for the Behavioral Health Program. Prior to going to AHM, Jeff served for over 5 years at Absolute Senior Care of Oklahoma City and A Premier Senior Home Care of Tulsa as their Director. We are beyond thrilled and honored that Jeff has chosen to join our team and know he is truly a valuable asset that will provide wonderful support to our growing company. Together, Weama and Jeff, will be able to provide assistance to our aging community, education to our referral partners, knowledge to our team of growing caregivers, and a bright and smiling face to see each time you encounter them. Serving people is what SYNERGY HomeCare does every day and it is truly the drive and passion of both Weama and Jeff. With over 100 caregivers and five years in business, the SYNERGY HomeCare team stands ready to answer specific questions about care. Whether you are a senior living on your own, with an aging spouse, or you have an aging parent – there are some key things to keep in mind when selecting a home care company. First, is the home care company licensed in the state? Companies are reviewed annually to determine their eligibility, and this is a perfectly normal question to ask a potential company. Ask to see a copy of their business license. Second, ask if the caregivers are employed by the company instead of being contract labor employees. It may seem beneficial to contract our work, but actually you can face many liability and scheduling issues down the road. Ask the provider to include client AND their family members in developing the plan of care. SYNERGY HomeCare has full-time RNS on staff to specifically build a plan of care for each new client and they spend the time you need to sort out every little detail. Lastly, ask for a list of references so you can check in on who you are considering to employ! We are all use to providing references when applying for a job. SYNERGY HomeCare is happy to answer questions like these anytime. SYNERGY HomeCare is a group of Oklahomans that you can trust. Weama, Jeff, and the whole team are honored to provide care to this amazing community and welcome your call anytime, day or night!